While not particularly harmful, bee stings can be quite painful and cause unwanted swelling and redness. Many bees aren’t inherently aggressive and will only sting to defend their nest, but most do indeed sting, including honeybees, wasps, hornets, yellow jackets, and even honeybees. Unlike bug bites, bees release small amounts of toxic venom, which could cause each individual person to react differently. Unless you are highly allergic, in which case medical attention should be sought, there are a number of home remedies for bee stings that can be used to reduce pain and hasten the healing process. The first measure to take after being stung is to remove the actual stinger. Each second that the stinger is stuck in your skin, a small amount of venom leaks out and into your body. Some say that scraping the stinger off is the safest way for removal, as pinching it out would result in more venom to enter your body. However, research suggests that removing the stinger as soon as possible should your goal, regardless of the method. While pinching the stinger would in-turn squeeze out more venom, more venom will be released if excess time is taken to remove the stinger in a ‘proper manner’. “Weal size, and thus envenomisation, increased as the time from stinging to removal of the sting increased, even within a few seconds. There was no difference in response between stings scraped or pinched off after 2 s,” says the findings of research. A bee sting could be painful for hours, while swelling and itching could last for as long as a week. Luckily, there are a number of home remedies for bee stings that could reduce the negative effects to just minutes. Try some of these natural solutions. Apple Cider Vinegar – Likely unsurprising to those who already recognize the extreme powers of apple cider vinegar, this liquid is also capable of reducing pain and discomfort from bee stings. After being stung, simple soak a paper towel or cotton ball with apple cider vinegar and apply it to the bee sting. This remedy works on most any bee sting, whether it be from a bumblebee or yellow jacket. Needless to say, the treatment of bee stings is only one of many apple cider vinegar uses. Honey – It may be funny to see honey as one of the home remedies for bee stings, but it isn’t surprising. The health benefits of honey range far and wide, with it’s antibacterial, antifungal, and antiseptic properties making it an effective treatment for numerous health problems. Dab some honey on a bee sting, and you can expect the pain and swelling to vanish within minutes thanks to honey being an antiseptic. Don’t try to steal any honey from the bees, though. Tobacco – Oddly enough, tobacco is among popular remedies for bee sting treatment. Same as the application of honey and apple cider vinegar, simply rub some tobacco on the stung area. If the above options don’t work for you, or if you just have tobacco near by, feel better in only a couple minutes with this treatment. Mud – Something available to all people nearly at all times, mud can also be used to help treat bee stings. Simply mix some soil and water to create a mud paste that can be rubbed on the stung area, then allow the venom to draw out and watch the swelling go down as the mud dries. Activated Charcoal – Recognized as an excellent multi-purpose detox agent, activated charcoal is also used by many for bee stings. Mix some activated charcoal with water and apply it to the sting site. Although there are other home remedies for bee stings many individuals would recommend, these options should certainly be of help. Remember to share any successes you’ve had with others so that home remedies may live on. Honey only works on a honeybee sting. 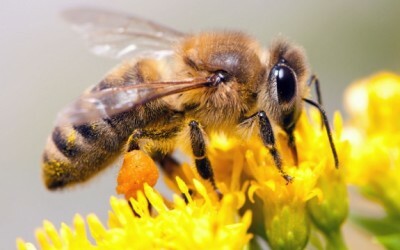 The reason is that honeybee venom is ALKALINE, and honey is an acid with a pH of 3. If you are stung by a wasp or yellow jacket/bald faced hornet, the opposite holds true. Use a baking soda paste (alkaline) because wasp venom is ACIDIC. I learned this in my washington state university extension beekeeping course. When my brother was a Boy Scout, they were advised to keep a dime in their pocket at all times (of course back then it was a silver dime!) Not only good for a phone call, but also for bee-stings. When stung, you spit on the dime and apply it to the sting. No idea what the reaction is between saliva and silver, but it does work for me! I still keep an old real-silver dime with me. also soy sauce. // regular soy sauce works also with burns & blistered skin. // best deodorant: milk of magnesia. Cut an onion in half a and place it on the sting…keep it there untill the pain stops. Takes about 10-20 minutes, and then no pain. I grew up on a farm, and we had bee hives. We are beekeepers and have had our fair share of stings. I'm afraid that some of the remedies listed above are less than effective. I can attest to a water/baking soda treatment, as Michelle mentions above. I've heard that some toothpastes work very well, also. Ice can reduce swelling and pain for quite a while. Cider vinegar, tobacco, mud, and charcoal are all lovely and useful substances… but probably should not be your first choice for beesting. Has no-one noticed that the insect shown above is not a bee but a wasp? Wasp stings need acid (eg vinegar) and bee stings need alkaline (baking soda solution) to help neutralise. I agree Andy. The best remedy that I have used is baking soda. I got stung by a big wasp, excruciating pain and within 5 min poured baking soda on the sting and within minutes the pain was gone as well as the redness that surrounded the sting. I like the common weed, Plantain, for all sorts of bites, stings and itching. I was always told to slap some baking soda paste or mud on a sting by my grandma and aunts-Wow thanks for the info! I seem to be a bee magnent. The wasps and hornets are the worst!